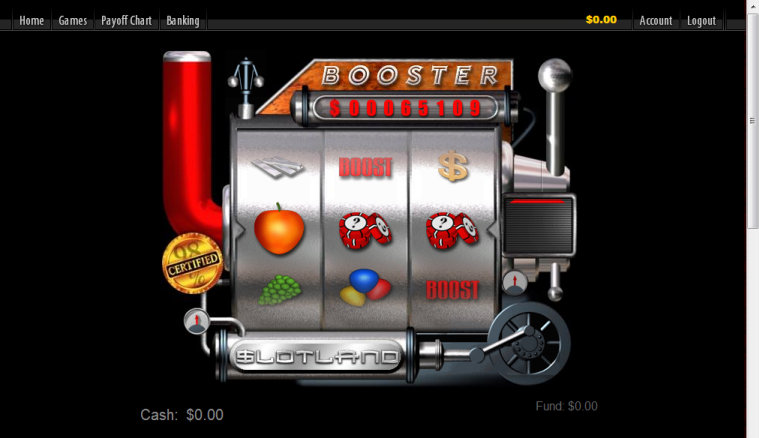 Overview: The Booster Slot game is a three-wheel, single-payline casino slot machine game with exciting features. 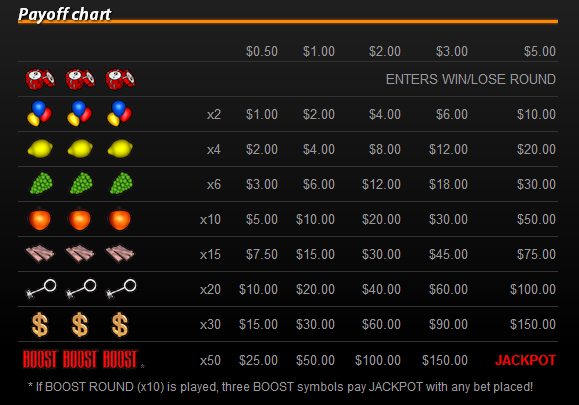 The BOOST symbol is wild and can be substituted for another symbol in the payline. Every time the BOOST symbol appears on any of the slot wheels, the game is interrupted and you can select either to keep the current bet placed or "boost" your bet 10 times (you "boost" your betting by clicking the smaller lever). This allows more ways to win at slot machines per single spin. Also, no bet is lost on the Booster game! Every bet which does not win is added to the special fund and can be cashed anytime for 10% of its value or you can choose to try and recover all of your bets by attempting to win the entire amount during a special WIN/LOSE spin that adds an extra spice to slot machine game. Similar Slots: If you like Booster, you might like these other slot machines from Slotland: Grand Fortune, Greatest Hits, Ice Queen, Lucky Stars, Slotris, Treasure Island.